Well this birthday, and especially this party, has had the world's biggest build-up at our place. 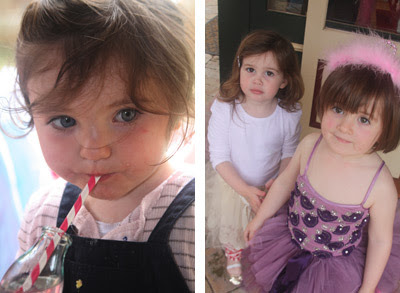 The anticipation for almost-three-year-old big girl Bondville was huge. And so the big day came and it was glorious. And gloriously imperfect. At 10:30am when guests were supposed to arrive, the laundry was still on the line, there was no food on the table, and no decorations (for which I had such ambition). Luckily I have some amazing friends who arrived right on time and saved the day. Julie stepped in and started whipping cream, arranging flowers, bringing in laundry *and* she brought tasty tomato galettes for the Mums. Mellissa came with a 3-year-old and a baby and still managed to string up all the doilies and set the table. LOVE you guys! The little ones had a great time at the craft table personalising their own wooden wands, and then breaking into the new PlayDoh Cake Makin' Station birthday present. It unexpectedly made a great party activity and kept the 3-year-olds entertained for hours. Marble cake with pink buttercream frosting, freckles, Callebaut white chocolate and cachous. 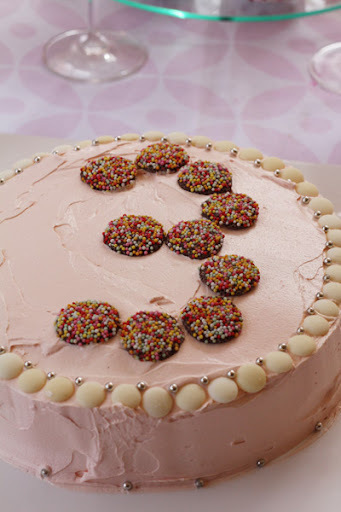 My big girl made the cake herself (with help from Mum). Pink geometric table cloth from my friends at Dandi (thanks guys!) - this particular design is no longer in stock, but there are some lovely new designs in a similar colourway coming soon. 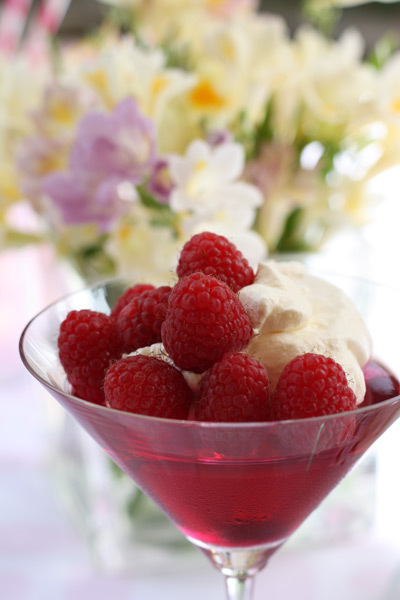 Raspberry jellies with whipped cream and raspberries. Another easy thing for kids to make. 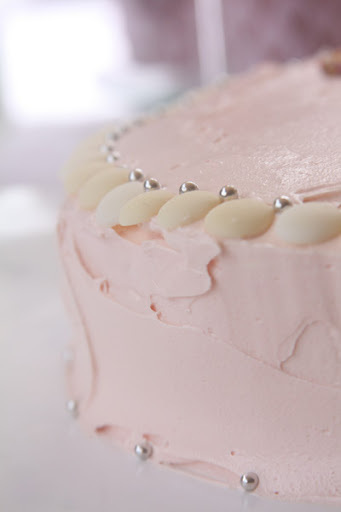 Robert Gordon pink heart doilies strung on pink and white butcher's twine from Jay Gee's Nook. 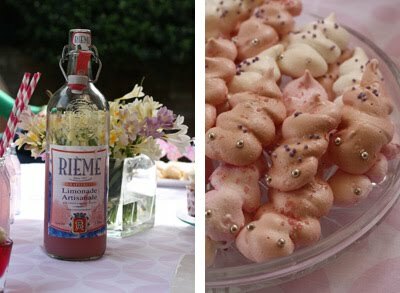 Rieme pink grapefruit and sparkling water drinks. The mini bottles are recycled Italian fruit juice bottles that I have squirreled away over the past few months. The gorgeous fuchsia retro paper straws were from my friends at Lark in Victoria (thank you Allison!). Wild fresias picked from the side of the road. Pink and white meringue caterpillars with cachous and sprinkles (lots of help from big girl for these too). Vanilla cupcakes (which my big girl also made) with left-over frosting from the cake. Heart edible toppers from Enticing Icing (part of the goodie bag at the last ABCD meetup). Robert Gordon cupcake wrappers. 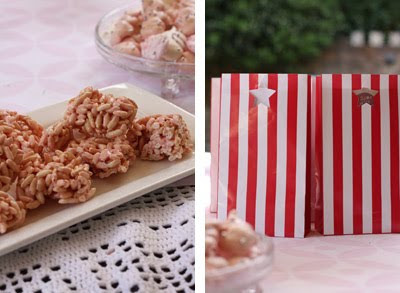 Pink rice crispies made with brown rice cereal. Red-striped goodie bags from Paper Eskimo filled with Daisy Lane swapcards (thanks Lark! 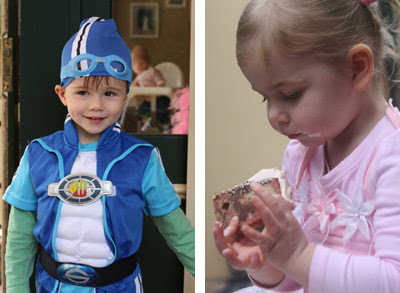 ), eeni meeni miini moh stickers, The Wiggles stickers, yoghurt frogs, freckles and marshmallows. And there you have it. We've had so much fun planning today and my big girl has been involved every step of the way. And that makes my big girl's 3rd birthday gloriously perfect. What a dream party - everything looks amazing!! Oh how sweet that party looks! It came together beautifully - well done Steph. Oh, what a beautiful party Steph! Love, love, love it all!! LOVE the doily garland ~ surprise surprise! What a wonderfully sweet birthday party! 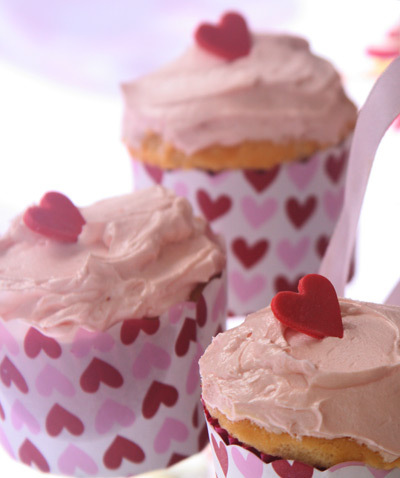 Those pink grapefruit drinks are adorable and the cupcakes? Hope you saved me one! Wow..everything looks so beautiful. 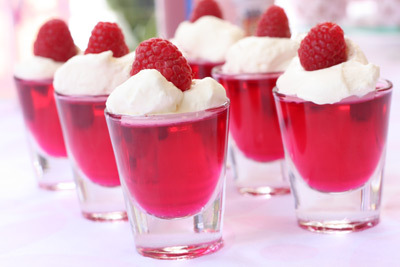 The raspberry jellies look yummy!!! Swooning Steph! Totally impressed that such beautiful details were pulled together at the end. 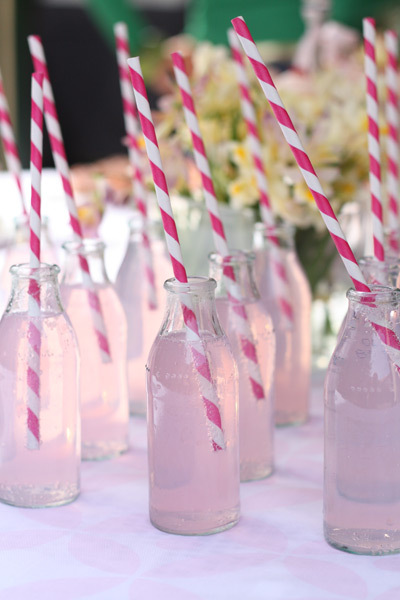 IN LOVE with the recycled glass bottles and especialy, the photo at the end! Well done! It looks amazing, I just can't believe you still had washing on the line at 10.30... ;) Raspberry jellies are a great idea! And I love the heart doilies. Oh it is just utterly beautiful! There are so many gorgeous ideas there! 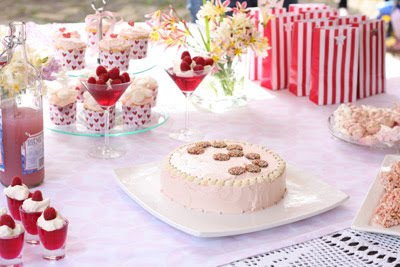 The raspberry jellies, the doilies, the glass bottles, the cake...I could go on all day! 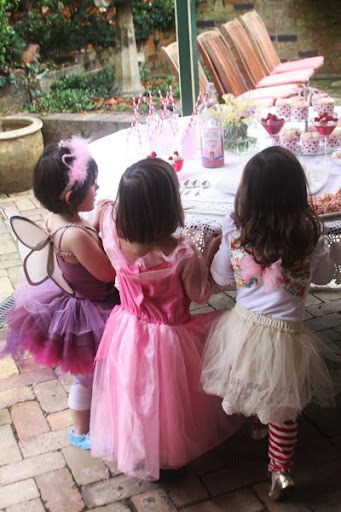 WOW what a fabulous day it all turned to be, I am sure your little girl had such a lovely time and I am so glad my little hearts came in handy, everything looked so beautiful! It all looks gorgeous! Great job Steph (and helpers). What a lovely photo of you both too. 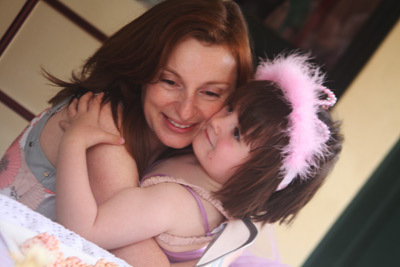 I think the 3 year old party has to be one of the most special. Even though there's always lots of excitement and anticipation, at 3 it seems the most magnified... in my experience so far anyway! Gorgeous party! The thing that I love the most is that your 'big' girl helped with it all - it's the way it should be - makes it even more exciting for them! 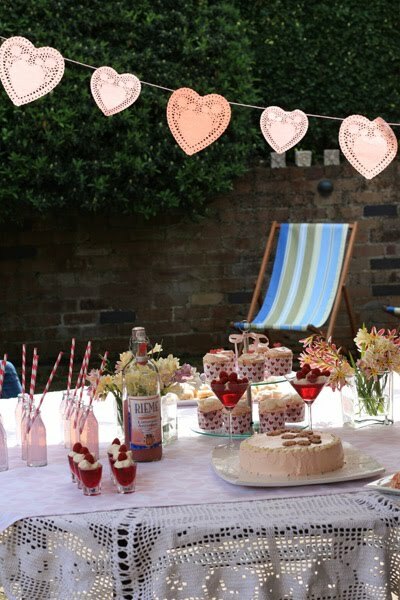 What a beautiful party - the cake and all the food looks scrumptious and I love the decorations, especially the heart bunting - will have to remember that idea. Hi Steph, you've peaked my interest. Could you tell us the brand of the italian juice bottles that you recycled for the party photographed on your blog please?